I’m inspired by all the sewing everyone is doing. It’s hard sometimes to keep myself on track when I see the wonderful projects all of you have going on. However, I will stick to 5 inspirations. I love how she takes on projects like they’re experiments. She’s afraid of nothing. If she’s curious about something, a fabric, a pattern, a technique, she does it. She makes a ton of stuff. I’d be curious what she deems her Top 5. Erica B from D.I.Y. Style! I’m such a huge fan of Erica’s style. I love her color choices and how she pairs stuff up. I would kill to get inside her closet. It’s just amazing what she’s made but the pairings. That’s her gift. Reading Chris’ blog, I started seeing costuming in a different light. I was a theater professional before leaving it behind to stay home with kids. I have always enjoyed wearing costumes but seeing how the costumes communicate a lot about mood and character, just to start, I’m learning from Chris. Erin unknowingly gave me back my confidence to make all the things. I’ve used her patterns to make a ton of wristlets and my go to bag is now the two zip hipster all because of her great work. I thought my Amy Butler Weekender was going to be my one and only bag I ever made…until Erin’s patterns. I have her new Day Tripper pattern ready to stitch up…and I’m not afraid at all. This project started out as a small endeavor and ended up with over 700 participants ready to test sew Titanic era patterns with little to no instructions. I was behind the scenes helping out in a volunteer capacity. I can’t tell you how much not only the patterns but the people in this project have inspired me. There are still a band of us hanging out online, sharing Titanic sewing stuffs as well as other sewing stuff. I am so much more confident about grading and altering patterns and vintage patterns are no longer something I will avoid. There are seriously a ton of people, blogs, places, smells, what have you that inspire me. I need to also add in some blog love for Jodi at SewFearless who has been cheering me on since I started my blog two years ago. She was one of the first people I didn’t know IRL to comment and tell me she was curious to see how I developed my bloggy home. Hugs Jodi. Anyone a fan of these top 5 (6) of mine? 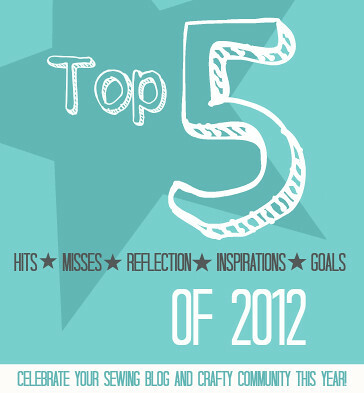 Some new blogs I need to check out!